Discounted Earlybird Registration until Mon. Aug. 31 for participants, and Mon. Sept. 28 for auditors – sign up today and save! Join us for a two-day groundwork clinic, designed to introduce you and your horse to the basics of clicker training. Safely learn practical and fun clicker training basic principles, and apply those principles to groundwork exercises. FREE! Two-week online pre-clinic course for participants – a $79 value! Online course includes written and video lesson material, and video coaching via private Facebook group – helping clinic participants to make the most their clinic experience by getting a jumpstart on the basics. This course is also the prerequisite for all of Peggy’s other online courses which include – Riding Behaviors from Ground to Under Saddle, Stationing and Backing, Trainer’s Choice. Bring a Friend Special – one half-price auditor slot with each participant slot! Just write ‘Bring a Friend Special’ and amount paid and name of person attending with, on your registration form. Details: All admission prices include drinks and lunch. 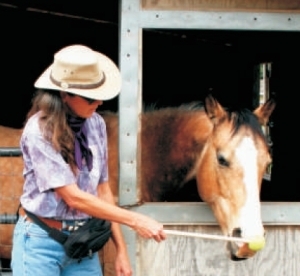 Participants may bring their own horse, or lease one of the gentle horses available onsite ($25/day). Covered stalls available, $10/day/night for visiting horses.